JULIAN LOVE: Finally, a decent pocket camera? Finally, a decent pocket camera? One of the things we gave up with the move to digital over the last decade, was the small but quality pocket camera. Today's digicams typically suffer from very poor high ISO performance, slow zoom lenses and glacial speed whens shooting RAW, if they shoot RAW at all. 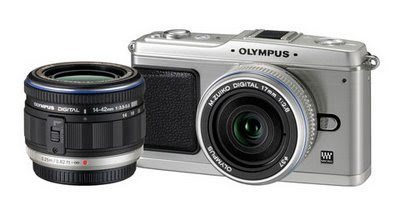 Back in the film days we had the Olympus Mju, the Contax TVS and various other high-end compacts. And because they took exactly the same film as their SLR cousins, you lost nothing in image quality. These days, if you want to take high quality images then that usually means packing an SLR. Now, when shooting professionally then sure, pack the SLRs and all the other gubbins. But when I'm out just taking pictures for myself or grabbing some shots of friends, I don't always want to lug around a big heavy SLR. But if you only carry a digicam you compromise so much on image quality that you end up just taking snapshots and not tryng to make real photographs at all. Generally anything shot at ISO 400 or above is a disaster, and the handling often leaves a lot to be desired. It seems that the launch of the micro-4/3rds format by Panasonic and Olympus last year might finally put that dilemma to rest. These cameras pack a sensor almost as large as an APS-C SLR, but by dispensing with an optical viewfinder, manage to squeeze it into a considerably smaller package. Panasonic have already had considerable success with their micro-4/3rds G1 and video-capable GH1, and now Olympus have lept into the ring with the EP-1. Featuring a compact 17mm f/2.8 (equivalent to 35mm on full frame) pancake lens and an optional accessory optical viewfinder, this might just be what I have been looking for. Mike Johnson over at The Online Photographer has always been an advcate of what he calls the DMD camera - DMD stands for "Decisive Moment Digital" - and on his blog he now has the first hands on preview of the new Olympus. If it lives up to my expactations of decent image quality and handling then I may well pick one up.